Teams from Médecins Sans Frontières/Doctors Without Borders (MSF) have begun distributing more than 50,000 family protection and home disinfection kits in Monrovia as part of the organisation’s Ebola response. The kits are designed to give people some protection should a family member become ill and also allow them to disinfect their homes, reducing the chance that others in the household could become contaminated. “In order to get the epidemic under control, all infected people must be able to have a bed in a treatment centre, but until the facilities that have been promised materialise, this will be impossible. 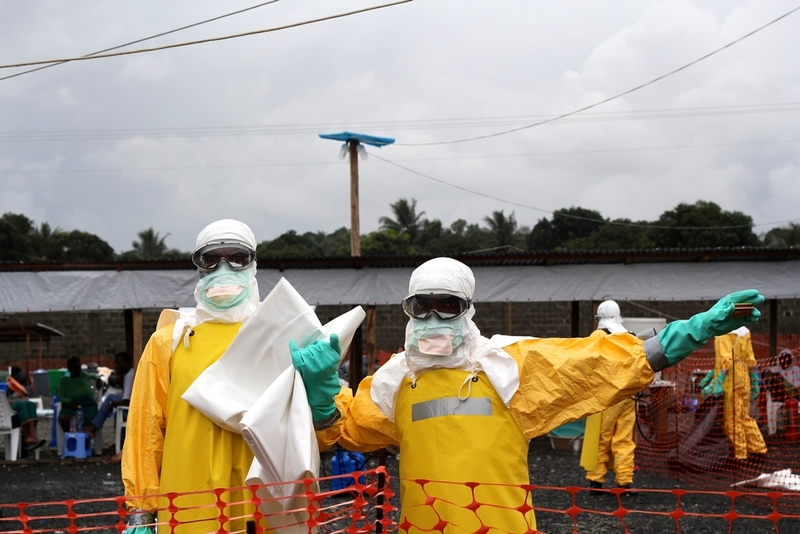 Only staff dressed in Personal Protective Gears are allowed to enter the Ebola Case Management Centre hot zone and nothing that goes in can come out. Already inside, Anneli Erickson, a nurse from Sweden, explains the patient observations on a sheet from her round to Veronique, a Canadian nurse on the outside, to rewrite the information on a new sheet of paper because the orginal sheet must be destroyed. The kits, which are in two buckets, contain chlorine, soap, gloves, a gown, plastic bags, a spray bottle and masks. The kits also contain health promotion messages and instructions for their safe use. MSF started the distribution by giving the kits to people who were turned away from MSF’s treatment centre when it was full, to contacts of patients at the centre, to those working at the centre as well as those who are living nearby. “Our kits are not designed to allow people to care for an Ebola patient in their homes,” said Laurence Sailly, MSF Head of Mission in Monrovia. “To do this safely, people need intensive training and support, but it will allow people to protect themselves from a sick family member for a short time until they can be admitted to a treatment centre." The kits were also given to higher risk groups such as health workers who may have caring responsibilities in their local areas. MSF is now focusing on families in densely populated areas of the city which have reported large numbers of cases, and where people may not have the money to buy items needed to protect themselves and their families, such as Westpoint and New Cru Town. The mass distribution, which started last Thursday (25th September), is expected to take between six and eight weeks. More than 16,000 kits have been distributed so far.